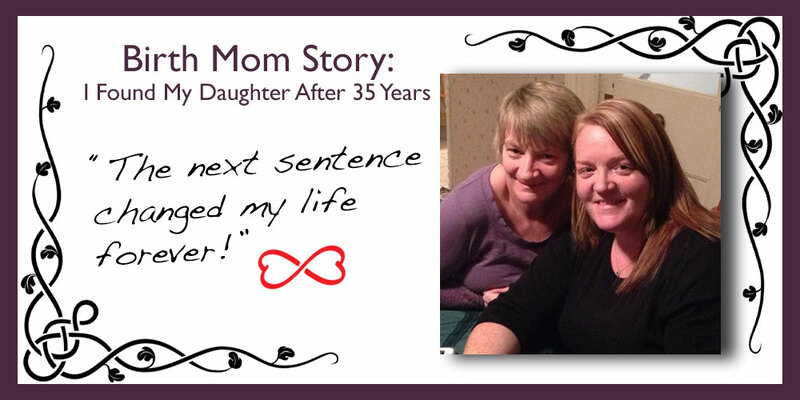 Birth Mom Story – I Found My Daughter After 35 Years! I had no where to turn, no idea what to do. You see I lived with an a alcoholic father and my mom had self commuted to a mental institution. My whole family was in turmoil. My father teld me I “could not bring that baby into his home.” I went to Social Services for help, but the only help they offered me was adoption. At first I was shocked! I wanted my baby. I kept thinking once I had the baby my boyfriend would come back to me. But as the pressure mounted at home and also from the social worker I decided adoption was my only choice. My baby girl came into this world 8 weeks early. I was not prepared. My mom had just returned from the mental hospital 2 days before I had her. I held her every chance I had in the hospital. The day I left the hospital and left her there was the hardest day of my life! In my day the baby did not go to the adopting family until after a 30 day stay in a foster home. After I went home I wanted her so bad that finally my dad said I could go get her from hospital and bring her home. I was so excited! We went and got her. The first thing my dad said to me when I walked in the house with her was “You have 2 weeks to get out of my house.” It was the middle of February and I had no placed to go. So after two days of listening to my parents fight and my Dad telling I had to get out, I knew I was defeated. I knew I could not raise this baby alone or in the dysfunctional house that I lived in. So on the second day I called my caseworker to come and get her. That was February 25,1978. It was the last time I ever saw her. In my generation you never talked about the baby you had and gave up. I had family members and friends who never even knew I had a baby. I had signed the papers and let her go. For 33 years I lived in shame and guilt never telling people I was a birth mom. I was ashamed of being a birth mom. Fast forward 33 years. That is when Becky form helpusadopt.org came into my life. She was was able to take away all the years of shame and guilt. She helped me see the pride and courage that it took for me to sign those papers relinquishing my parental rights to my daughter. She was able to change my whole life in more ways than one. If we fast forward again another 2 years, that is when Becky introduced me to Susan. Little did I know that my whole world was going to change again. Susan is a search angel that helps birth moms find children they placed for adoption. I had never heard of a search angel before. Two hours later we where standing in a Pizza Hut Parking lot in Canton N.Y. hugging. We have not let go yet. We just celebrated our first anniversary and I will never let go again. We are one of the lucky ones because we got our happy ending. We have each other back.